In one week, Olympic gold medalist Kendall Coyne Schofield forever changed the landscape of women’s hockey. 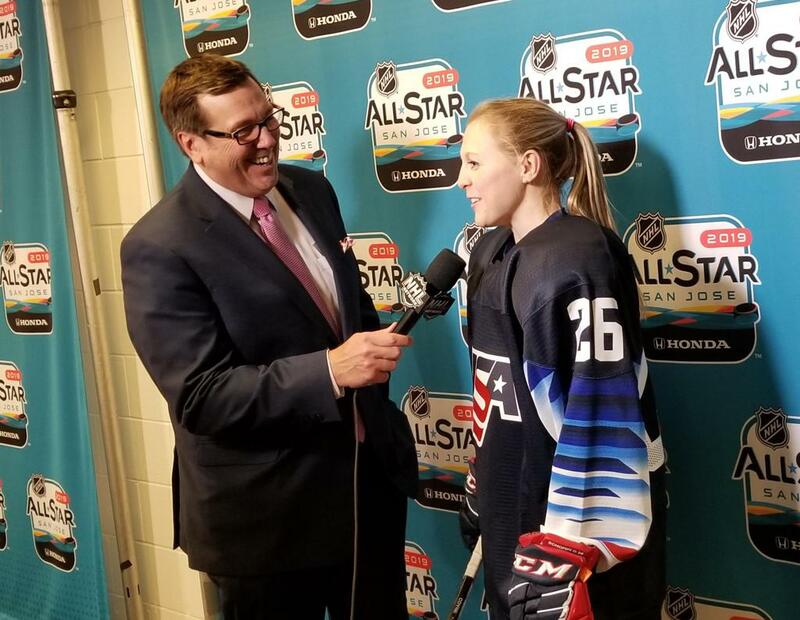 Coyne Schofield became the first woman to compete in the NHL All-Star Skills Competition and followed it up four days later with a stint as an analyst on NBCSN’s regular-season NHL broadcast between the Pittsburgh Penguins and Tampa Bay Lightning. Entering 2019, Coyne Schofield and her husband Michael — an offensive lineman for the Los Angeles Chargers — wondered how they were going to follow a 2018 that saw the athletes get married and Coyne Schofield win an Olympic gold medal among other highlights. Coyne Schofield celebrates with her husband, Michael, after winning Olympic gold in 2018. 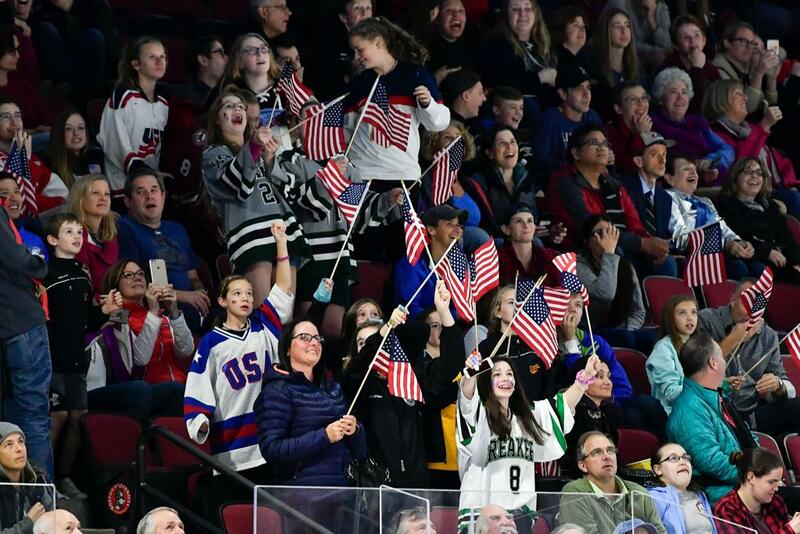 Coyne Schofield’s life most certainly changed after she helped the U.S. Women’s National Team to a historic gold medal at the 2018 Olympic Winter Games in PyeongChang, South Korea. Coyne Schofield and her teammates made an appearance on “Ellen” and “Jimmy Fallon,” met the U.S. women’s soccer team and also rang the bell at the New York Stock Exchange, among other highlights. The team visited the White House during a trip to Washington D.C. and was also recognized at the Team USA Awards for Olympic Team of the Year and ESPN’s ESPY Awards for the “Best Game” of the year. 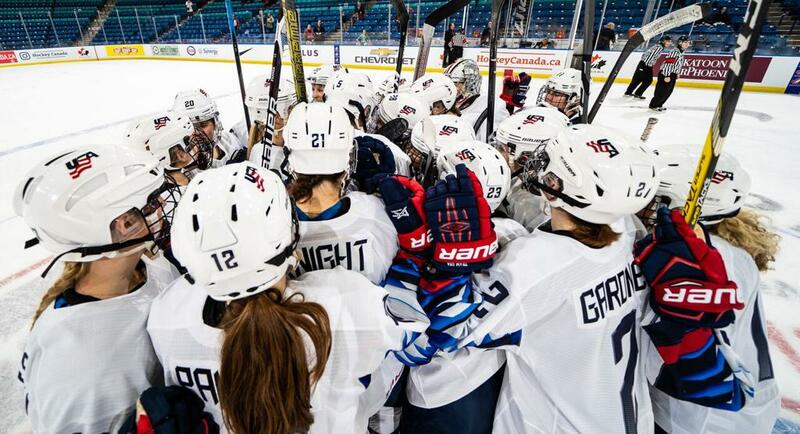 Coyne Schofield and her teammates carried momentum from their Olympic gold medal-winning effort with a fourth straight Four Nations Cup championship. “It was a huge moment to win Four Nations coming off the Olympic win,” Coyne Schofield said. Coyne Schofield believes the NHL made a statement with her inclusion in the NHL All-Star Skills event. It also put the rest of the world in touch with the women’s game. Coyne Schofield was already in San Jose to help demonstrate NHL All-Star Skills events, along with U.S. teammate Brianna Decker and Rebecca Johnston and Renata Fast of Team Canada. A day before the NHL All-Star Skills competition, Coyne Schofield clocked a 14.226 in the rehearsal for the Fastest Skater event. When it was determined that Colorado Avalanche forward Nathan MacKinnon couldn’t compete because of a bruised foot, Coyne Schofield came to mind as a replacement. NHL executive Patrick Burke was at the rehearsal and suggested the gold medalist. Four hours before the event, Coyne Schofield received a public invitation to compete in the form of a tweet from the Avalanche. Tampa Bay Lightning head coach Jon Cooper extended his congratulations at the event. He saw the U.S. Women’s National Team up close while it stayed in Tampa Bay during its residency period prior to the Olympic Winter Games. And it did. But that doesn’t mean Coyne Schofield wasn’t nervous prior to the event. An interaction with Edmonton Oilers forward Connor McDavid, who won the Fastest Skater title for the third straight year, helped calm the nerves. But then Coyne Schofield made history, blazing a time of 14.346 — one second behind McDavid’s winning time — and finishing seventh of eight skaters. The historic moment had the hockey world buzzing and NBC capitalized by hiring Coyne Schofield as an analyst for the Wednesday Night Hockey game between the Lightning and Penguins. Coyne Schofield is first all-time at Northeastern in career goals and points, but she also was a communications major and covered the men’s hockey team as a reporter as her schedule permitted. Coyne Schofield was thankful to experience every aspect of the broadcast at the highest level of hockey. She helped with pre-game coverage and played bubble hockey with Penguins defenseman Brian Dumoulin. Coyne Schofield covered the game at ice level during the first period before moving to the booth for the final 40 minutes. The experience also fueled the elite athlete in Coyne Schofield. Coyne Schofield also realized that calling a game is more difficult than it looks. Coyne Schofield was recognized on the arena scoreboard for her accomplishment during the game and also had interactions with the players while in between the benches. Coyne Schofield also chatted with Penguins All-Stars Sidney Crosby and Kris Letang in the locker room following the game. It was a great experience that changed the landscape of women’s hockey and it all started at the NHL All-Star Skills Competition.